IIM Indore team consisting of Anunita Raghu, Poorva Tripathi, Prahallada P and Shruti Maheshwari (all from PGP 2016-18) won the First Runner-up position at the coveted Steel-a-thon 2017. The final round of the competition was conducted on November 27, 2017. 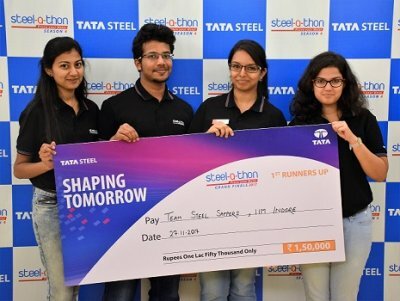 Steel-a-thon is Tata Steel’s Annual Business Challenge Competition conducted across premier B-Schools. This year’s edition was the fourth season of the competition, and the Grand Finale was in Kolkata. Students were required to choose one case study across domains of Corporate Strategy, Marketing & Sales, Corporate Social Responsibility, HRM, Supply Chain & Logistics. Campus winners competed at the Grand Finale, presenting their ideas to the leadership of Tata Steel. IIM Indore team worked on the corporate strategy domain and won the Campus Round with Rs. 30,000/- as prize money. Campus Winners then took part in the Grand Finale, which had 16 teams from various B-schools. Each of the teams were mentored by Tata Steel’s leadership for this round. IIM Indore team received the First Runner-up position and won a cash prize of Rs.1,50,000/- (One lakh fifty thousand only). The Institute congratulates the team for their achievement.